Day Pass - $52 (after 20% discount) Saturday or Sunday - See an entire day of music for one low price. To purchase simply put premium tickets (the dark purple ones) for both shows during either Saturday or Sunday in to your cart and purchase at once. The discount should apply automatically at checkout. Multiple pass purchases are OK, but make sure you have the same number of seats for each show. Samarth Nagarkar is a Hindustani classical vocalist, known for his captivating performances of traditionally rich music. Samarth has been featured in several prominent music festivals and venues around the world. He has two solo albums titled ‘Pravah’ and ‘Pranali’, a book titled ‘Raga Sangeet’ and several other collaborative albums such as ‘Out of the Blue’ and ‘Ragas Live Retrospective’, to his credit. He is Guru and Director of Academic Affairs at Chhandayan Center of Indian Music in New York and frequently presents lectures and master-classes at schools like NYU and MSM. Trained under distinguished gurus and performers, Ulhas Kashalkar and Dinkar Kaikini, he is a former scholar of the ITC Sangeet Research Academy in Kolkata. Pursuing a full-fledged career as a performer, composer, teacher and author, Samarth is described by critics as one of today’s most prolific performers and a torchbearer of the traditions he represents. Rachna Nivas is an artist, choreographer, educator, and entrepreneur in Indian classical dance, bringing meaningful leadership to Kathak. 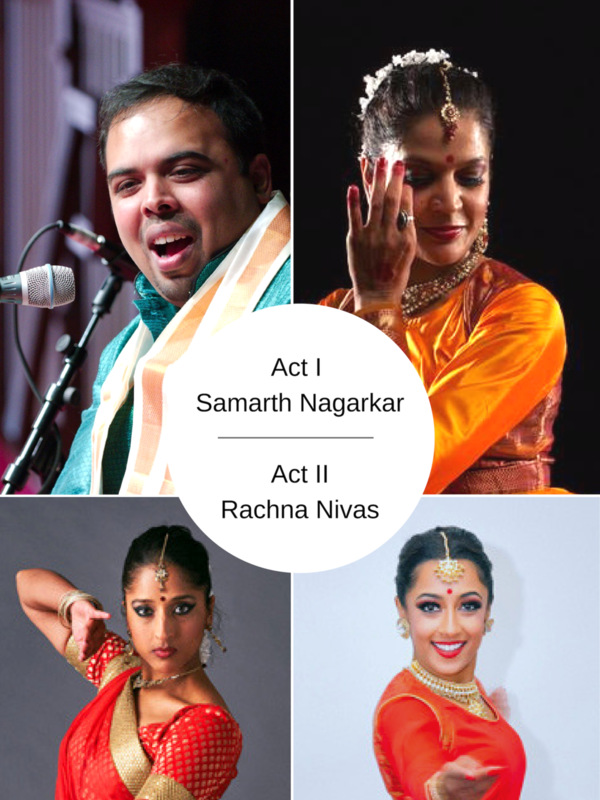 Deemed “charismatic” and “revelatory” by the San Francisco Chronicle, Rachna is a fierce performer – a technical powerhouse with masterful creativity and infectious charm. Displaying the depth of her 17-year training under legendary Guru, Pandit Chitresh Das, she is a distinguished torchbearer of the treasured lineage. Rachna was principal dancer with the internationally touring Chitresh Das Dance Company for 15 years and received two nominations for an Isadora Duncan Dance Award. Her original solo work, Meera, was featured at the ODC Walking Distance Festival in San Francisco and at Salvatore Capezio Theater in New York City. In 2016, she co-founded the Leela Dance Collective, producing powerful works through the collective creativity of trailblazing women in Kathak. Rachna is currently touring her latest collaborative work SPEAK, bringing together leading women in kathak and tap and bridging Indian and Black-American/African art and and heritage. Her works have been funded by National Endowment for the Arts, Zellerbach Family Foundation, California Arts Council, and Alliance for California Traditional Arts.She is Co-Director of the Bay Area based Chhandam School of Kathak, one of the world’s leading institutions for 38 years in classical Indian dance, art, and culture, and is also Artistic Director of the Chhandam Youth Dance Company, shepherding excellence, leadership, and creative discovery amongst teens. Rachna’s larger vision is to raise awareness, through kathak dance, of the rich philosophies of the Indian subcontinent, and for it to be a tool for empowerment and social change. Ria DasGupta and Joya Kazi are both ensemble dancers with the Leela Dance Collective. Ria trained in classical ballet and modern dance for 14 years with the Academy of Dance Arts in Red Bank, New Jersey, and she also co-founded Kalamandir Dance Company, a troupe that she choreographed for and performed with internationally. Joya began studying indian classical dance at the age of 4, attended UC Davis as a Theatre & Dance major, and moved to LA to pursue a commercial career in both the Hollywood and Bollywood industries. Both dancers have found a love of kathak that has connected them to their classical roots and after years of intensive training, they were both honored to debut with the Leela Dance Collective in the San Francisco premiere of the Collective's acclaimed work, Son of the Wind.